Walter Rane is an artist who began his career working for magazines and books but now specializes in religious art. He studied at the Art Center College of Design. His paintings can be found in temples and meetinghouses across the globe. He now lives in New York City where he serves as a bishop. -WHAT PAINTINGS DECORATE YOUR HOME? Mostly my own; some paintings of members of my family or paintings that I couldn't sell. We also have work by our sons who are also artists. -WHAT'S THE LAST PAINTING THAT REALLY MOVED YOU? A painting titled “Galisteo Creek” by Susan Rothenberg which hangs in the Metropolitan Museum in New York. I can stand in front of it and ponder it forever. -WHAT MAKES A GOOD RELIGIOUS PAINTING? WHICH RELIGIOUS PAINTERS DO YOU REALLY ADMIRE? Something that evokes spiritual feelings that transcend the specific image or subject matter of the work. Something that engages the viewer and encourages or inspires spiritual thoughts and feelings. Caravaggio, Rembrandt, Tintoretto, William Blake. -WHO IS A PAINTER THAT HAS A KNACK YOU REALLY ADMIRE? WHAT IS THAT TRAIT? Edgar Degas. He lived 100 to 150 years ago, yet his compositions are very modern. His work is representational, however, if you ignore the subject matter his paintings are beautifully abstract. -WHICH PERSON THAT YOU KNOW HAD THE BIGGEST IMPACT ON YOUR ART HABITS/LOVE OF PAINTING AND ART? That has to go back to my parents because that love began so early, it is deep in my subconscious. -WHO IS AN ARTIST PEOPLE MIGHT NOT THINK YOU LOVE, BUT YOU LOVE? WHO IS AN ARTIST PEOPLE THINK YOU WOULD LOVE THAT YOU DON'T LOVE? Willem De Kooning. Because he realized that paint was more than a tool or medium to depict or represent something else. Paint is beautiful in itself. William Bouguereau. A neoclassical artist that was very popular and successful in his day but was eclipsed by the impressionists. He has recently become very popular among contemporary figurative painters like myself, however I feel that although he was extraordinarily skilled his work lacks depth of feeling. -WHAT'S A FAVORITE SCENE FROM SOMEONE ELSE'S PAINTING? 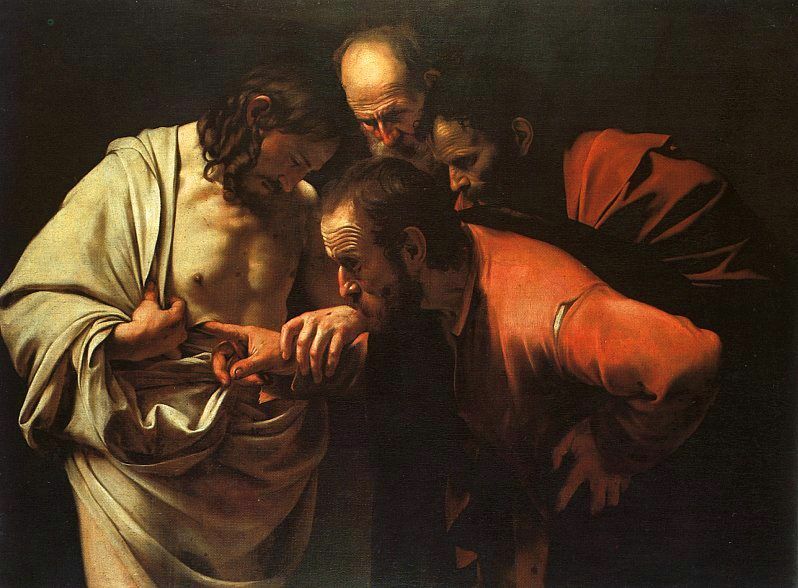 “Doubting Thomas” by Caravaggio. This painting is very tactile. It is full of powerful feeling and meaning. The composition pulls me right into the scene. It depicts the resurrected Christ with Thomas and it leaves no doubt that the resurrection is real and tangibly physical. -WHO'S AN ARTIST YOU'RE AN EVANGELIST FOR? Rembrandt. I would like to be more original with this answer but his paintings exude a humanity that is very powerful and that I can’t turn away from. -WHO ARE THREE ARTISTS, DEAD OR ALIVE, YOU WOULD LOVE TO HAVE OVER FOR DINNER? -WHO IS A PAINTER YOU WOULD LOVE TO RECOMMEND TO OUR READERS? James Turrell. Actually not a painter but he is a visual artist. He builds installations that use light itself as his medium, focusing your attention on the effects of light on the environment. I just keep painting, that’s all I can do. More information about Walter Rane can be found on his website.